Is that the same salad spinner whose lid unceremoniously flew out your kitchen window while we were preparing for Lauren's bridal shower?! Yes Shannon, the very same one that flew out the window and fell two whole floors to the cement sidewalk below! And still it lives and works just fine! I think it deserves to continue to live and not be replaced! Such a nice entry(I would love to see the spinner as well, sounds like a great history it has! )Lovely drawing of your filofax, Yes, it has become rediculous, the prices of these agendas, even just the yearly refill. Yu have a lovely style and I just love your colours. So subtle but always just right. You did a wonderful job on this, Shirley. I agree about it being a very difficult challenge - it goes against the grain, somehow, portraying something ugly. Sometimes it IS really hard to find something ugly. Usually we don't keep stuff we find ugly around. I still can't think of what to draw, myself! :) Really wonderful drawing! isn't it funny how we keep things for sentimental reasons and 'just because' reasons. You did a great job on this filofax. This looks well loved, and not at all ugly. I'm not surprised you are not ready to part from it. There's nothing ugly about this sketch, it's beautiful. The colors you used are wonderful. I'm very attached to my Filofax too. It's like a dependable old friend! This is a wonderful choice of subject, though not ugly in the least. $50 to replace the clasp?? Your solution is way more creative. 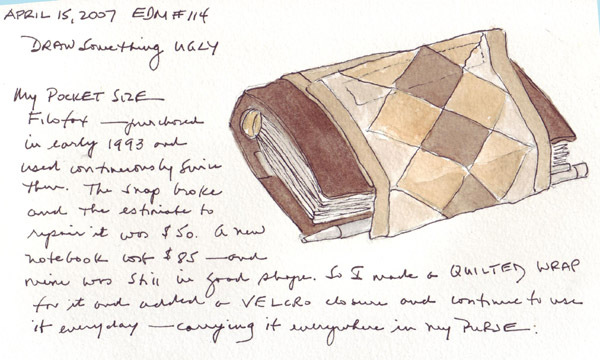 I love the sketch of the Filofax, and the story behind it. Its one of my biggest regrets in life ,that I have ZERO artistic talent whatsoever, yet love looking at art. I had some lessons, but soon realised it was a lost cause. I'd be content with just being able to sketch something I see when travelling, like your lovely sketch of a gate. I'm currently setting up a Filofax to take to Italy as a travel journal, and I'm also hoping my wife will do some sketches while we are there, for memories.